Everyone has heard of this one, a truly beautiful gemstone – it is fossilised tree resin, sometimes millions of years old. It may sometimes contain trapped insects and animal life. We sell a wide range of Amber, including natural pieces, polished pieces, tumblestones and carvings. 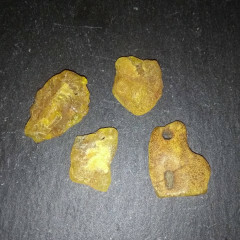 Amber is a gorgeous fossilised tree resin, which can be found worldwide. It has been used as a gemstone since antiquity. Some pieces can be scientifically important due to high quality inclusions of insects and organic matter. 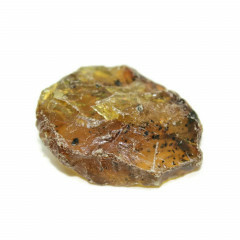 Amber is pretty much exclusively used as a gemstone – it is cut and polished into jewellery – cabochons, especially. It is also carved into a range of other decorative objects. In some parts of the Baltic, Amber and Amber markets are actually quite a large tourism draw! It is quite often used for religious purposes, too – Christian and Muslim rosaries being a key example. It is also used for babies teething necklaces sometimes, too! Why does everyone love Amber? This gemstone has been known for its distinct colour and beauty since Neolithic times – beads made from the resin have been found in graves dating as far as back as 8000 BCE. There are a wide range of colours – the better known ones are honey, yellow, orange, red, and butterscotch, but it is rarely found in a blue colour or even a green. It is a fossilised tree resin formed from millions of years of heat and pressure. The sticky resin could sometimes trap small insects and plants; these pieces are very rare, and are an especially coveted and unique material. A polished piece with insects trapped inside is an amazing sight – while fossils are interesting, insects trapped inside the resin appear almost perfect in condition – these creatures walked the Earth thousands, if not millions of years ago, and a polished piece seems almost like a window into their past. Amber is found in several countries worldwide, although it is sometimes known by different names. The most common, and one of the most prized locations for this gemstone is the Baltic – it is mined in legal and illegal open pit mines in Kaliningrad Oblast, but is found throughout the Baltic Sea region. In some parts of coastal Poland, it washes up on the beaches after a storm – I have been lucky enough to see a fisherman with a net pull a fist sized piece out of the sea near Gdansk. In the Dominican Republic and some other locations worldwide, it is found in a unique blue colour. There are several theories as to the cause of this, but it may be due to forest fires in ancient times. Amber can be found in a few places around the world. The most important and famous deposits are in and around the Baltic Sea area, especially Poland and parts of Russia. It can also be found in the United Kingdom, Germany, Borneo, the Dominican Republic, the United States, Colombia, Spain, Hungary, and possibly other locations. 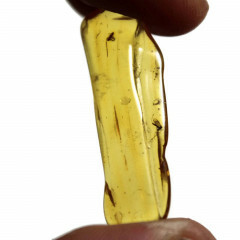 Most Amber sold online will be from the Baltic, the Dominican Republic, or Borneo. As far as I know, there are no dangers or hazards associated with Amber. If cutting and polishing the stone, dust could be an issue – make sure to use adequate ventilation. 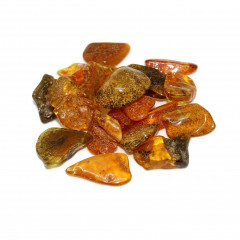 Amber is thought of as a very powerful healing stone, both physically and mentally. It is helpful for reducing stress and anxiety, as well as depression. I can understand that, personally. It’s a lovely warm feeling material, with a bright, cheerful colour. It is also thought to heal the body on a physical level, aiding tissue regeneration and giving energy. 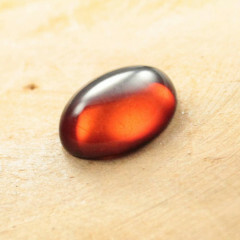 There should be no issue using Amber as an elixir, as it ought to be perfectly safe in water. It is sometimes even used for babies teething necklaces. 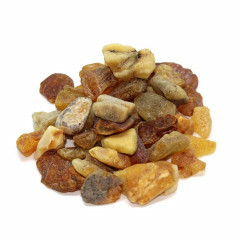 Some people choose to use Amber elixirs as a healing tonic, and believe it can work as a natural antibiotic. 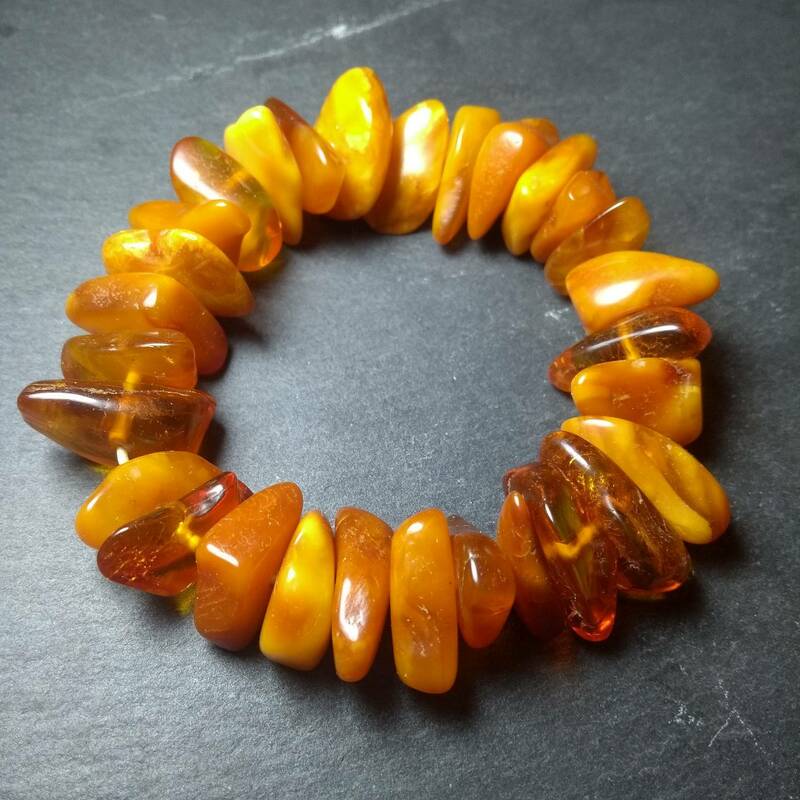 Amber is typically used as a Chakra cleanser, and works well with the Sacral chakra and the Solar Plexus chakra. 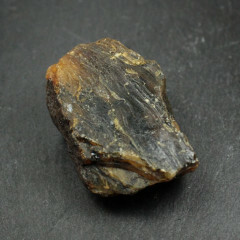 Some people believe Amber is good for the Zodiac sign of Taurus.